Thanks to some ridiculous shooting in 2014, Kevin Durant has emerged as the odds on favorite to win the NBA MVP title (literally so, according to betfair). If we use Win Probability Added (WPA) as a proxy for MVP-worthiness, then the stats agree. As of March 22, Kevin Durant leads the league in Win Probability Added, with a season total of 11.76, a good two games ahead of his closest competition, Lebron James. There are few things more tiresome than semantic debates about what "Most Valuable Player" actually means, so I'm not wading into that morass. But if we assume for the moment that MVP=WPA, then the Durant/James MVP race has been fairly close for much of the season. 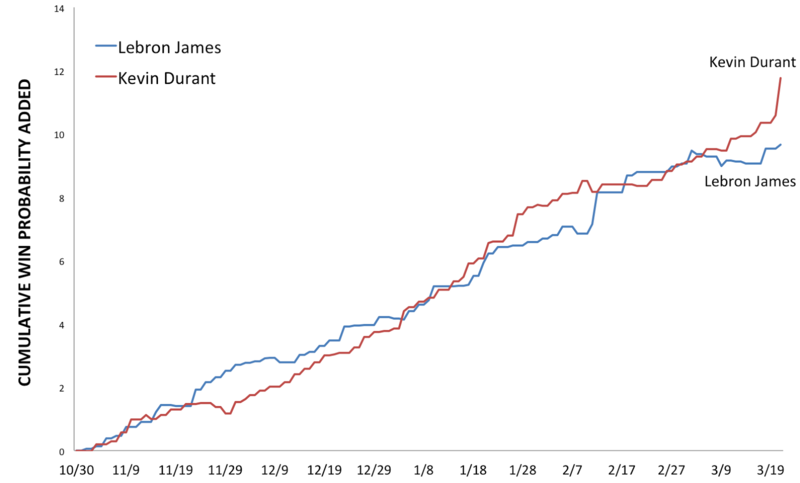 The chart below summarizes Kevin Durant and Lebron James cumulative WPA totals for the season.